The choice is directly linked to the sculptor. 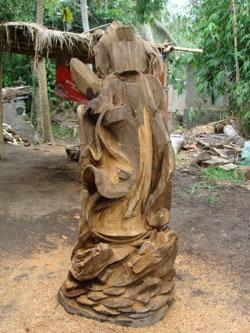 Indeed, he chooses the wood to be used in relation with the work and the work’s perpetuity. Then, the selects wood water content, the fiber cross, diameter of the trunk. The sculptors know each other. They meet and choose the one who is the most approprate to realize the work. Why of duration and the spreading of the work of the wood ? Sea shipment will take one month for the 3 continents where Asiart ships the goods. Conclusion : If you want a unique wor, it will take five months.